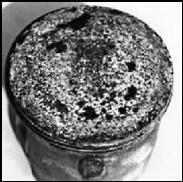 The process of examining a used piston can tell a mechanic helpful information on the condition of an engine. 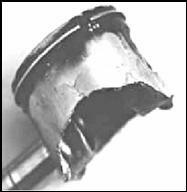 When an engine failure occurs, the piston is likely to take the brunt of the damage. A careful examination of the piston can help a mechanic trace the source of a mechanical or tuning problem. This technical article serves as a guide for the most common mechanical problems that plague engines. The pistons shown in the pictures came from motorcycle engines but the principles are the same. 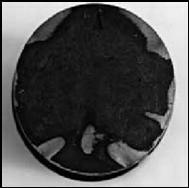 The crown of this piston shows an ideal carbon pattern. The colour of the carbon pattern is chocolate brown. That indicates that this engine's carburettor is jetted correctly. The underside of this piston has a black spot. 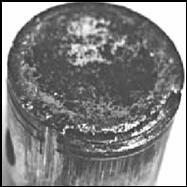 The black spot is a carbon deposit that resulted from oil burning on to the piston because the piston's crown was too hot. The main reasons for this problem are overheating due to too lean carb jetting or coolant system failure. 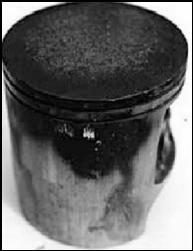 This piston crown has an ash colour, which shows that the engine has run hot. The ash colour is actually piston material that has started to flash (melt) and turned to tiny flakes. If this engine was run any longer, it probably would've developed a hot spot and hole near the exhaust side and failed. The main causes of this problem are too lean carb jetting, too hot spark plug range, too far advanced ignition timing, too much compression for the fuel's octane, or a general overheating problem. 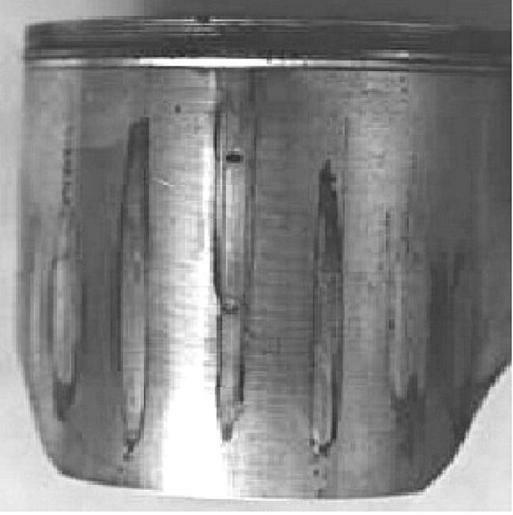 This piston crown has been damaged because debris entered the combustion chamber and was crushed between the piston and the cylinder head. This engine had a corresponding damage pattern on the head's squish band. The common cause of this problem are broken ring ends. When a problem like this occurs, its important to locate where the debris originated. Also the crankcases must be flushed out to remove any left over debris that could cause the same damage again. This piston crown chipped at the top ring groove because of a head gasket leak. The coolant is drawn into the combustion chamber on the down-stroke of the piston. When the coolant hits the piston crown it makes the aluminium brittle and it eventually cracks. In extreme cases the head gasket leak can cause erosion at the top edge of the cylinder and the corresponding area of the head. Minor leaks of the gasket appear as black spots across the gasket surface. An engine that suffers from coolant being pressurized and forced out of the radiator cap's vent tube, is a strong indication of a head gasket leak. In most cases the top of the cylinder and the face of the cylinder head must be resurfaced when a leak occurs. 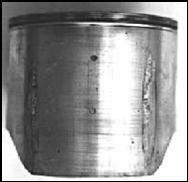 This piston has vertical seizure marks at four equally spaced points around the circumference. A four-corner seizure is caused when the piston expands faster than the cylinder and the clearance between the piston and cylinder is reduced. The main causes for this problem are too quick warm-up, too lean carb jetting (main jet), or too hot of a spark plug range. 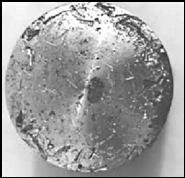 This piston has many vertical seizure marks around the circumference. This cylinder was bored to a diameter that was too small for the piston. 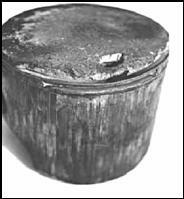 As soon as the engine started and the piston started its thermal expansion, the piston pressed up against the cylinder walls and seized. The optimum piston to cylinder wall clearances for different types of cylinders vary greatly. For the best recommendation on the optimum piston to cylinder clearance for your engine, look to the specs that come packaged with the piston or consult your supplier. This piston didn't fail in operation but it does show the most common problem, blow-by. 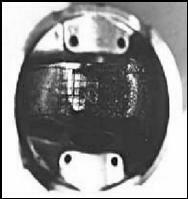 The rings were worn past the maximum ring end gap spec, allowing combustion pressure to seep past the rings and down the piston skirt causing a distinct carbon pattern. Its possible that the cylinder walls cross-hatched honing pattern is partly to blame. If the cylinder walls are glazed or worn too far, even new rings won't seal properly to prevent a blow-by problem. This article, by Malcolm Watts, originally appeared in CA7C Seven Focus in Jan 2006 pp16-18.